A very special event is coming to Warsop this autumn. 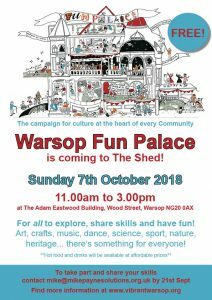 For one day only, The Shed – also known as The Adam Eastwood Building – will be transformed into the Warsop Fun Palace! In celebration of the culture and creativity in our community, individuals and groups will come together on 7th October to share their skills and passion for art, crafts, music, dance, science, sports activities, nature and heritage – all under one roof! All are welcome to join in the fun from 11am to 3pm on Sunday 7th October at The Shed just off Wood Street in Market Warsop. Hot food and hot and cold drinks will be available at affordable prices. For more information on the event, visit www.vibrantwarsop.org.